Summary (from Goodreads): “Poignant, well-paced and compassionate, Game Plan is an achingly real look at how two families cope when life doesn’t go as planned.” Tish Cohen, bestselling author of The Truth About Delilah Blue and Inside Out Girl. Review: When I was first approached to review this book, I was reminded of the movie Juno–the unexpected pregnancy, infertility and adoption. However, this is a surprisingly fresh and new story. While it has all those elements, Sampson has presented each struggle in a unique way. This book will appeal to both young adults and adults alike since the topic is mature. I laughed and cried my way through the book. It was a quick read because I just had to know what was going to happen next. While I have to admit that beginning was a little slow, Sampson does an excellent job developing her characters and letting the reader get to know them before all the action takes place. Each character’s reactions and feelings are spot on. 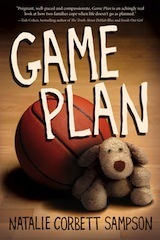 Enter to win one eCopy (format chosen by the winner) of Game Plan by Natalie Corbett Sampson.